India is known across the world for its diverse and colorful dresses. Indian saris and salwar suits are known for their beautiful designs and patterns. The modern Indian clothing is a blend and an effect of various cultures and nationalities that made India their home in the ancient times. Hence, the Indian clothes you see today are a reflection of various changes in the Indian history. Harappan Period — 2500 B.C. India was perhaps the first country to grow cotton in the Harappan period. In this period, people mostly wore cotton clothing. Women generally wore a long cotton cloth called sari. 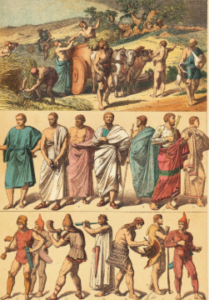 Aryan Period — 1500 B.C. During this period, most women wore sari that could be draped in different ways. The material generally used was cotton for the poor and silk for the rich. The men wore pieces of white cloth around their waste in a pants-like fashion, which was known as dhoti. Islamic Period – 1000 A.D.
With the invasion of the Islamic rulers, Indian fashion underwent a great change. While sari and dhoti were still popular, women also started wearing long tunics with trousers called salwar kameez, which were accompanied by a scarf. 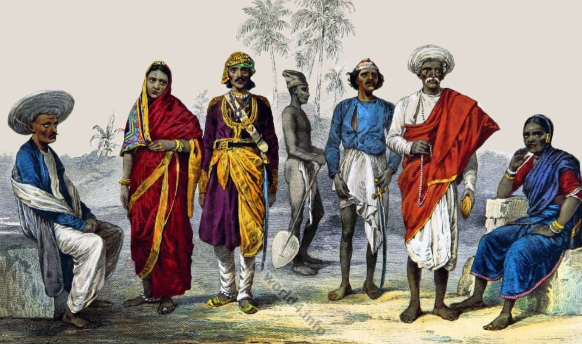 The 19th century saw a lot of modifications to Indian clothing. The Western and Islamic influences were greatly seen in the Indian saris and salwar kameez. The modern Indian clothing is now a confluence of Eastern and Western cultures. Westernized salwar kameez and other new fashionable attire have modernized the traditional Indian clothing.